Buying for someone else is hard. Loop makes it easy. Choosing the right gift for family or friends has always been tricky & retailers have long battled the rising cost of returns & cart abandonment as a result. 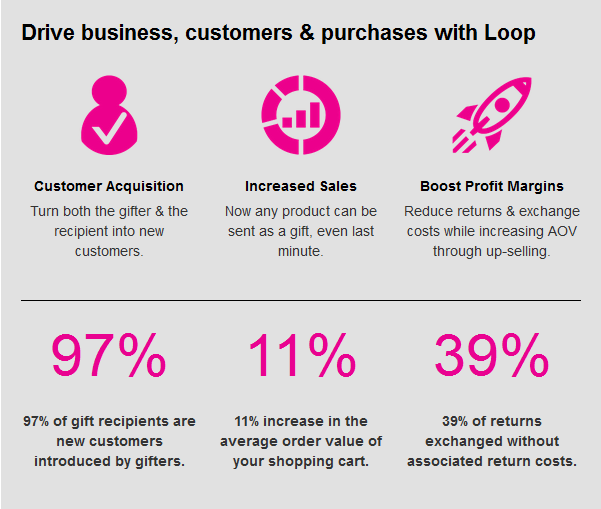 With nifty personalisation & discreet exchange features, Loop Commerce has brought a thoughtful & practical gifting solution to take away the gifting headache for shoppers & boost profit margins. At Session Digital, we’re a recognised Loop Commerce integrator & one of the first agencies to embrace this ingenious technology. Wanting to enhance the online gifting experience for its customers, Gift Library has adopted Loop Commerce, an innovative online gifting solution that allows its customers to shop for any gift, regardless of the recipient’s size, delivery location or particular preference. For example, the recipient can personalise their gift by choosing their favourite colour or match it to items they already have, which considerably reduces returns. To read further about how Session Digital implemented Loop for a luxury gifting site, check out the case study on Caroline Stanbury’s Gift Library. Next Post Why Should Gifting Matter To You?